Often only specific scenes from videos need to be transcribed, for example in order to perform a more detailed analysis on these scenes. In these cases you have the option of transcribing individual passages in the Multimedia Browser. Open the video file in the Multimedia Browser. Right-click on a point in the waveform from which you want to start transcribing. 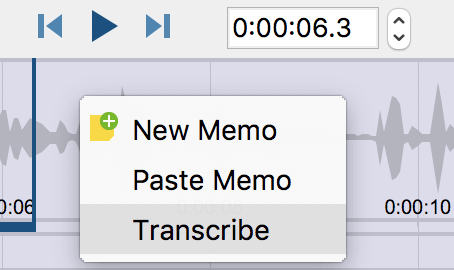 Select Transcribe in the context menu. MAXQDA will then open Transcription Mode so that you can start transcribing straight away. The starting time of your selected video sequence is automatically added to the transcript. Additionally, a timestamp is set to link the transcript with the video. Clicking on the timestamp will play the video from the corresponding time position in the Multimedia Browser.